Paterson Bird Store: New Jersey's Bird Store for more than 100 years, specializing in hand fed parrots, bird toys, bird cages and bird products. Knowledgeable and friendly owners and staff.....Great Customer Service. Our famous Double Yellow Headed Amazon Kiwi was purchased as a hand fed "baby" through the Paterson Bird Store. 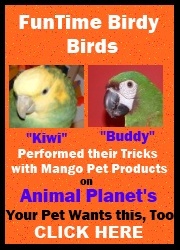 Kiwi is famous for doing his bird tricks on Animal Planet's "Your Pet Wants this Too" in November 2010. Judy Leach's Parrots: Breeder specializing in macaws, including Hyacinths, offers an educational and entertaining website. Information about care and diseases. Pictures and description of many species. Questions answered. African Grey Parrots: Informational website on African Grey Parrots...lots of great info here. Started by one of our very own customers and starring her African Grey "Jasper"
Buyers Index: This is a great search engine for shopping online. Harmony Animal Behavior Barbara Bingham Deutscher, CPBT-KA, Training, Behavior Solutions and Enrichment for all Animals....Specializing in Birds.... improving the lives of animals in our care.